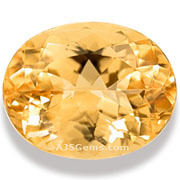 Topaz is a gem with excellent hardness -- 8.0 on the Mohs scale -- but most topaz found in nature is an uninspiring color, either colorless or an insipid yellow or brown. Some of this common topaz can be irradiated and heated to produce the cheap blue topaz that is ubiquitous in commercial jewelry. 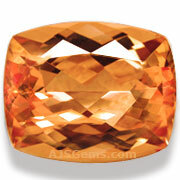 The only topaz that has real value in the gems world is precious topaz, known in the trade as imperial topaz. Imperial topaz is golden to golden-orange to orange, pink, pinkish-red or violet in color. 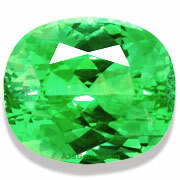 It is a rare stone that is suitable for all kinds of jewelery. It is essential that the color of imperial topaz be completely natural. 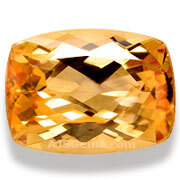 Some of the imperial topaz colors can be simulated by irradiating colorless or weakly colored topaz. You will see these treated stones selling for a few dollars a carat from auction sites. Unfortunately the color tends to fade quickly when exposed to sunlight, so the fake imperial topaz is a poor value even at its modest price. High quality topaz is typically very clean, so the main grading distinctions for imperial topaz are by color (and, to some degree, by cut). The least expensive imperial topaz color is the bronze or golden hue. The golden-orange tends to be more expensive, while the golden-orange with red dichroism enters the realm of the rare and expensive. If your imperial topaz displays a red flash, then you know you have a valuable stone. Any imperial topaz with a pinkish hue -- even a pinkish secondary -- is especially valuable, and an orange-pink or reddish-pink is extremely rare. A true pink-red or red topaz is the ultimate rarity. We have a substantial collection of imperial topaz in all grades. 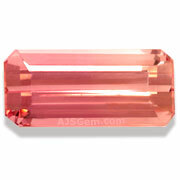 In this month's notable gems we feature a recent addition to our collection -- a rare pink-orange with red flash. This is a very fine specimen for the imperial topaz collector or a special piece of jewelry. This month we feature some fine new acquisitions to our collection. 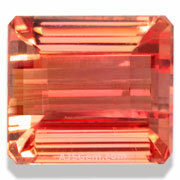 A very special Imperial Topaz in a very rare pink orange. This extraordinary gem shows flashes of red and orange as it is turned in the light. Completely clean and precision cut, this amazing stone show full fire and brilliance. A treasure for the topaz connoisseur, this rare stone will make a stunning ring. Guaranteed natural and untreated. A fabulous chrome tourmaline in a very large size, one of the finest specimens we've seen. Open color with exceptional clarity (graded loupe clean), this gem has wonderful fire. 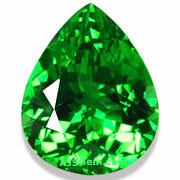 This is an exceptional gem for the serious collector, and will make an impressive pendant. Guaranteed natural and untreated. From time to time we have some of our finest gems set in jewelry. This gorgeous 7.57 emerald-cut blue zircon from Cambodia is set with 16 diamonds in an 18k white gold pendant. A stunning Mahenge spinel in a hard-to-find rectangular shape. 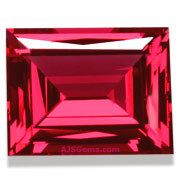 Superb pink-red color with excellent clarity, this fine gem has been precision cut and polished to perfection. An exquisite gem for a special piece of jewelry. Guaranteed natural and untreated. A dazzling matched suite of spessartite garnets for ring and earrings. 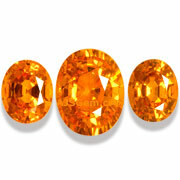 These fine garnets display the vivid orange of the best Nigerian spessartites with full fire and brilliance. The large oval is 4.07 cts while the matched pair is 2.95 cts total. Guaranteed natural and untreated. 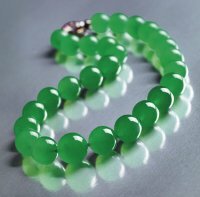 Cartier paid $27 million for an imperial jade necklace at Sotheby's April auction in Hong Kong. The necklace features 27 color-matched translucent green jadeite beads ranging in size from 15.4 to 19.2 mm. The necklace was owned by Barbara Hutton for many years, and has appeared at auction twice previously. It first sold for $2 million in 1988 and then for $4.2 million in 1994, an indicator of what is happening to gemstone prices. You can see all our matched pairs by clicking on the link. We also have put together a number of gem suites which include matched pairs. These have all been carefully matched by our staff for color, shape and size. The diamond type is a scientific way of classifying diamonds by the type of chemical impurities. Here's a brief introduction. The main grades are types Ia, Ib, IIa and IIb. Type I diamonds are the most common, making up more than 98% of all natural diamonds. Their main impurity is nitrogen, giving these diamonds a characteristic fluorescence and absorption spectrum. Type II diamonds have no nitrogen impurities, and type IIa diamonds have no impurities of any kind. They are very rare (about 1.8% of all gem diamonds) and were formed under extremely high pressure for longer periods of time than type I diamonds. Some famous diamonds such as the Cullinan are type IIa diamonds.